While Finn has been pillaging my loot and stealing away in the middle of the night with the fair maidens I had my eyes on - Stuntmutt, the scabrous dog insists he was first to come across this little gem. I know he's wrong, but I'll be damned if I can prove it. Halo. Its divine wind will rush through the stars, propelling all who are worthy along the path to salvation. Of course, 'divine wind' is a literal translation of 'Kamikaze' (see below). A possible in-joke by the writer that the Covenant would be committing suicide...? In the Japanese language, kamikaze (IPA: [kamikaze]) (Japanese:?? ), usually translated as "divine wind" (kami is the word for "god", "spirit", or "divinity"; and kaze for "wind"), came into being as the name of a legendary typhoon said to have saved Japan from a Mongol invasion fleet in 1281. In the interests of a fair and thorough investigation - and in keeping him quiet - here it is for all to see. I'm always telling the truth, yet people are always surprised when I do. the Master Chief killing Flood. He has just spent many hours wading through the Flood trying to stop them, GS 343 is simply confused as to why he (MC) would hesitate now he has the chance to stop them all. There is a saying " If you look long enough at a hay stack you'll find a needle". Now (since I was doing Halo-related research) the first thing that came to mind was that there seven Halos, or rather, seven installations as the monitors put it. But I wasn't completely sure, so I asked a friend in IRC. He confirmed it, and linked me to the Halo 2 Cutscene Library here at HBO. I was even more elated to find that the exact timestamp on the movie was indeed 1:16, exactly the same as the verse number that I had just seen. I watched the cutscene over and over again, and saw Keyes jump over and crawl under the unnecessarily complex system of machines that orbit around the platform, and the timing of the energy blast that emanated from inside the Halo. It all seemed so deliberate, as if the time and verse correlation was meant to be there. Bungie was at its tricks again. In the making-of video, they were saying things like "Cortana has been left away from the chief," and "She's in the clutches of the Gravemind." This got me thinking... how could she be talking to Master Chief? She's half a galaxy away. "I have defied gods and demons"
Presumably this line refers to her actions with regard to Guilty Spark, an "oracle" of the Covenant's "gods" and her actions with regard to the "demon," Master Chief. This hints that she is not talking to the Chief, since it seems unlikely that she would refer to him as the demon. "I am your shield. I am your sword." More on this later. Suffice to say, I believe we should be very cautious of Cortana's motives in the third game. "I know you; Your past, your future"
This one could apply to MC, but it could also apply to Gravemind. When she was in the Installation 04 computer system, one would assume she learned a great deal about the past of the flood, and it's presumed future after a firing of the rings. Which brings me to the most rampant speculation, and ties in with my theories about the "sword/shield" line. I think Cortana sides with the flood. She is the "shield" and the"sword" of Gravemind because she will use her position in the human military to protect him and his flood forces, and to stage covert attacks against the human network. A woman on board is bad luck, aye . . .
Yeah, we missed the bus; this is one news post I almost hope slips under the radar. Unfortunately for the tech savvy, info-on-demand children of the children of the Sesame Street generation (with their whimsically short attention spans), recent these are not. For the complete updates in question, check out here and here. Lots o' stuff. Earth. Or what's left of it. "I'm guessing those ruins in the back are Old New Mombasa, so, whereabouts is the Chief and this Forerunner structure?" "That is indeed the ruins of New Mombasa. The artifact and the Chief are where they appear to be, on the desert outskirts of New Mombasa, and many miles inland. The mountain behind him is Kilimanjaro." "Seriously though, how long have the covenant had control of Earth before the cutscene started? Days? Weeks?" "The Covenant have basically been in control of Earth since the final events of Halo 2. What was left of the human forces was either distracted by Delta Halo, or already overwhelmed by the sheer force of the Covenant onslaught." "Does the canyon / hole in the trailer have something to do with New Mombasa and that spacejump the Covenant Capital Ship made at Halo 2? " "That's an excellent question. A Slipspace jump in-atmosphere would have a devastating effect on an environment, don't you think?" "Also, are those rings sticking up in the background remnants of the space elevator?" "Yes, that is the wreckage of a fallen "tether." "
Cortana and that old familiar feeling. "My wife didn't recognize Cortana when she watched the announcement. I thought Cortana looked exactly the same. But my wife is smarter than me. So, I better ask. Is Cortana any different? She seems somehow different. My wife didn't recognize Cortana when she watched the announcement. I thought Cortana looked exactly the same. But my wife is smarter than me. So, I better ask. Is Cortana any different? She seems somehow different..."
"Women know things John. I don't know how they do, they just do." "Please have Cortana's lines pronounced so that I don't see 36 threads about it." "I have defied gods and demons." "I am your shield, I am your SWORD." "I know you, your past, your future." "This is the way the world ends." "But there's obviously something terribly wrong..."
Dah dah dah. Or is there? A lot of speculation had been going around wondering if the Spartan in the H3 trailer was actually Fred, Linda, &c. And, it made sense in a way, considering the upgraded components of the armour (as in First Strike). However, Frankie was quick to shoot this one down: "...and the Chief (no it's not Linda, or Kelly...)"
"Q: I noticed the Master Chief's armor was scraped and damaged, what happened to him? "Is 343 Guilty Spark's idea of years based on Threshold orbiting its star? No weird Lagrange point concept of years?" "Technically a year could mean either the time it takes Earth specifically to revolve around Sol, specifically or some other rhythmic celestial phenomenon. The concept might not have much meaning if you're from a planet whose orbit is stable enough to have no seasons, right? So the question is; Does Guilty Spark's translation into a language understandable by Chief and company simply refer to some rotational indicator - either the Halo itself, Threshold or the closest star? Or does his translation include knowledge of their solar system? Or did I JUST BLOW YOUR MIND, MAN?" How coy. All things considered, such as the rather casual, non-cagey response from Joe Staten on the same point, as well as the need for at least some semblance of standards in a sci-fi story (like Gravemind or the UNSC speaking English) our (my?) money is on a Halo 04 Local Year equalling an Earth Year as simply a matter of convenience. "Is it possible that sometime in the future, Bungie may work on another Marathon game?" "Of course it's possible. We're not doing that at the moment, however. Two suggestions get leveled our way frequently - do a Live Arcade port or make a full-on Next Gen Marathon game." "In the LE Booklet it speeks of a female named "Cassandra" is she a Spartan or not?" "A better question would be, "was" she a Spartan?" Hmmm. This strongly implies what has been assumed for some time: that Cassandra is the "Spartan too injured to continue active duty" mentioned in the The Fall of Reach. Early-evening naps are a double-edged sword. On the blissful face of consequence, those initial, drowsy moments give way to an incredible slumber, wiping away in one fell swoop the combined unrest of a dozen long days and baker's dozen short nights. But woe to those early-evening nappers whose sleep is not a single thread, those sorry folk who rise to face a waning sun still powerful enough to extract its due, vengeful and distressed by their conspicuous absence. I've always had a soft spot for the Continentals. Geoff Chang (greyalpha@gmail.com) writes concerning a possible dalliance between the writings of Nietzsche and the character of 343 Guilty Spark. Keen. The 7 scarred on Miranda's cheek. Neato. A new enemy in the HGN? 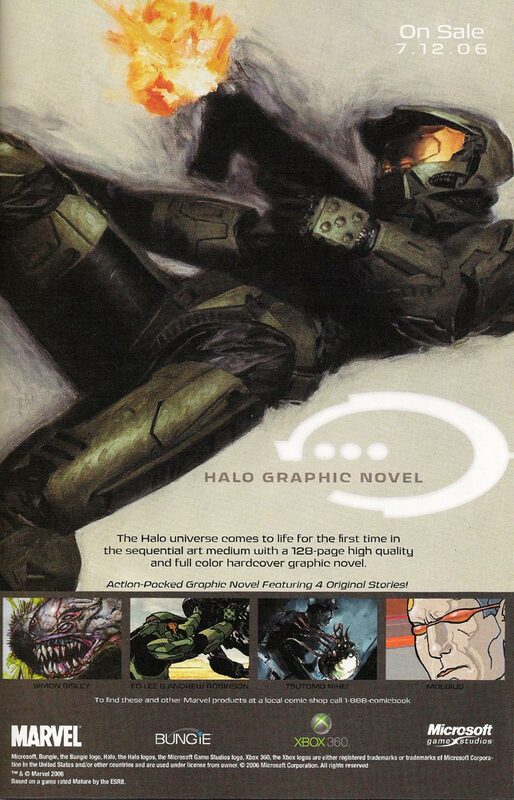 A while ago, Ross Mills noticed an advertisement for the Halo Graphic Novel; one of the drawings (seemingly by Simon Bisley, artist of "The Last Voyage of the Infinite Succor") shows an elite-like creature, but with no split mandible and, most noticeably, four eyes rather than two. While some artistic license is to be expected, other images by the same artist clearly show an Elite with the usual split chin and ocular equipment. So what are we looking at? A Flood form, or something completely different? Time, as always, will tell.